The largest apartment building since the beginning of the Great Recession has broken ground in Los Angeles, promising to reinvigorate the Koreatown neighborhood. The Vermont is a two-tower, mixed-use behemoth that will contain 464 apartments and plenty of retail. 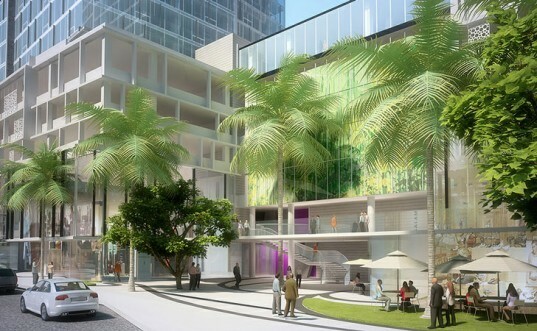 Besides the size the other notable features, we really like is the green space wrapping through the project, adding some relief to the concrete jungle that is LA. 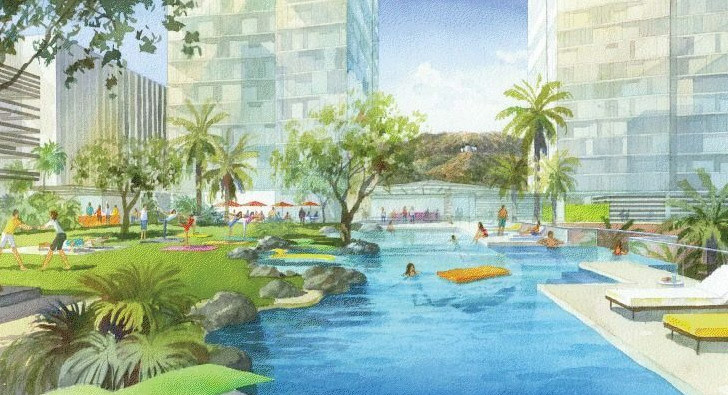 The $200-million dollar project is a response to increased demand for urban apartment rentals in the city and the designer and builder Jerde and developer Jerry Snyder’s vision of reenergizing the core of LA. The project will certainly change the neighborhood with its 16- and 22-story towers dedicated to rental apartments. The development will also add 12,000 square feet of green space, and it will feature a gym, a spa, and street -level supermarket and retail. Located next to the Purple and Red lines, the residents of the new buildings will have easy access to public transit. But the plans also calls for almost 1,000 parking spaces — so while the scale helps make LA a more viable place to work and live, the car is still gets its share of real estate.